The all-new Firefly PRO rescue strobe lights are the brightest and most feature-packed strobe lights on the market today. With three activation functions, toggle between the ultra-bright strobe or the SOS strobe to visually alert Search and Rescue of your location, then toggle to the Steady-On feature for close-up recovery operations. Our innovative new wide light emission LEDs produce a 360° beam of light (41 candela) allowing for visibility of over 3 miles. Our cool white light has no yellow tinting which allows for a more visible light beam that can be seen at greater distances. 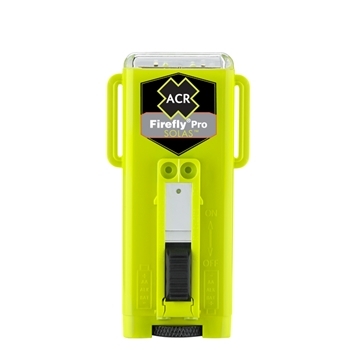 With an energy efficient microprocessor and redesigned electronics, the Firefly PRO boasts maximum operation life in the harshest of conditions. With a single set of AA Lithium batteries, the Firefly PRO will continuously strobe for over 56 hours or use the Steady-On feature for 28 hours. Model 3970.4 easily exceeds USCG and SOLAS requirements.